Planning to write love letters for him or her? Learn some tricks to making one-of-a-kind love letters, full of thoughtful sentiments and heartfelt ideas! My man's recent out-of-town work trip spurred me to wrote letters, sealing them up in envelopes, and tying them with a ribbon. I included instructions to open one each day while he was away. I knew the daily reminder of how much I cared would keep his spirits up and keep me on his mind! I had so much fun writing these love letters for him–you can too! Try these DIY love letter ideas for him or her, and share sentiments your loved ones will cherish forever! The project requires only a few necessities: Stationery envelopes, a pen, and some ribbon or string. Feel free to go wild with this project. The more eclectic and varied the letters, the more fun they will be to open. Take a field trip around your house collecting anything you feel might make good stationery. I even used my vintage typewriter to type out one letter. Then, I used a page torn out of my personal journal. Be just as creative with the envelopes. Use different styles and colors. Don't rush your letter writing. Take a free afternoon to write, or spread the project out over a few days. Sit in a quiet place, (I chose my porch with a cup of coffee!) and focus on that special someone, recalling memories, affirming them, and telling them how much you care. When you're done with each letter, spritz a little of your perfume on the paper, and swipe on lipstick to leave a cute kiss-mark on the seal. Label the envelopes Day 1, Day 2, etc. and tie up your little bundle with a ribbon. *Editor's Note: Don't know what to write? Think of your favorite song lyrics, lines from a favorite movie, or even a favorite moment you two have shared. Recall fond memories, happy memories, funny memories, anything that will remind them how much you love having them in your world! Here are some thoughtful quotes for Mothers, part of our DIY Mother's Day Card Series! When you present your love letters for him or for her, don't be surprised if they tear up! They will be overjoyed to see how much you care about them, and a daily reminder of your love will help pass the days until you see them again. Just be sure to remind them: Only one letter allowed per day! That make sense! This year's must have beaded bracelet kit is yours for FREE. Grab it for yourself or your Valentine! Now you know how to write love letters for him or her, or really anyone in your life that you cherish! Apply these DIY love letter ideas and tips which are so fun to craft and just as fun for the reader to open! These are way more meaningful and sincere than just sending text messages or emails to someone special. 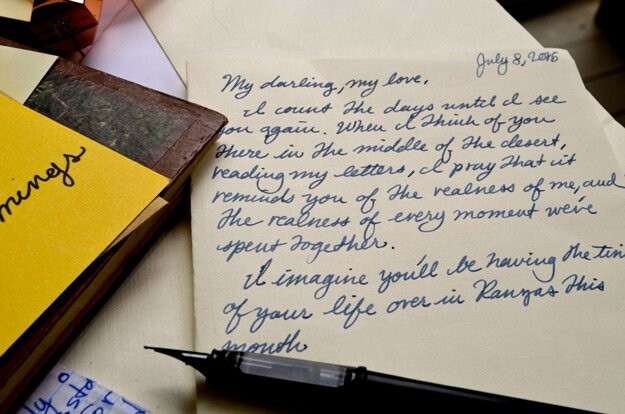 These love letters for him or her may be old but they are as precious as gold! Don't forget to share them with your family and friends. This year's perfect Valentine's Day gift is this DIY beaded bracelet kit and is yours for FREE. Do you have more love letters for him or her you want to share? Let us know in the comments below! These ideas will help you create the sincerest gift to give to someone! But if you need more DIY gift ideas, check out these 9 Free Printable Valentines Day Cards!